Background Discontinuing anti-platelet therapy prior a surgical intervention may increase the risk for thrombo-embolic events during the post operative period in a high risk patient population. This study evaluates the feasibility and safety of performing laparoscopic sleeve gastrectomies (LSG)in morbid obese patients receiving low-dose aspirin to prevent cardiovascular complications during the peri and post operative period.Method: We have conducted a retrospective review of 292 consecutive patients undergoing a single stage LSG from October 2006 to December 2009 The technique involved the use of linear staplers loaded with bovine pericardial strips.RESULTS:A total of 39 patients receiving low dose aspiring underwent laparoscopic sleeve gastrectomy. Mean age was 51.66 (range of 26-66 years old), mean body mass index of 51.12kg/m (range of 37-71kg/m), and a mean weight of 326.61lbs. (range 202-477lbs.). The mean length of stay was 1.92 days (range of 0-6days). 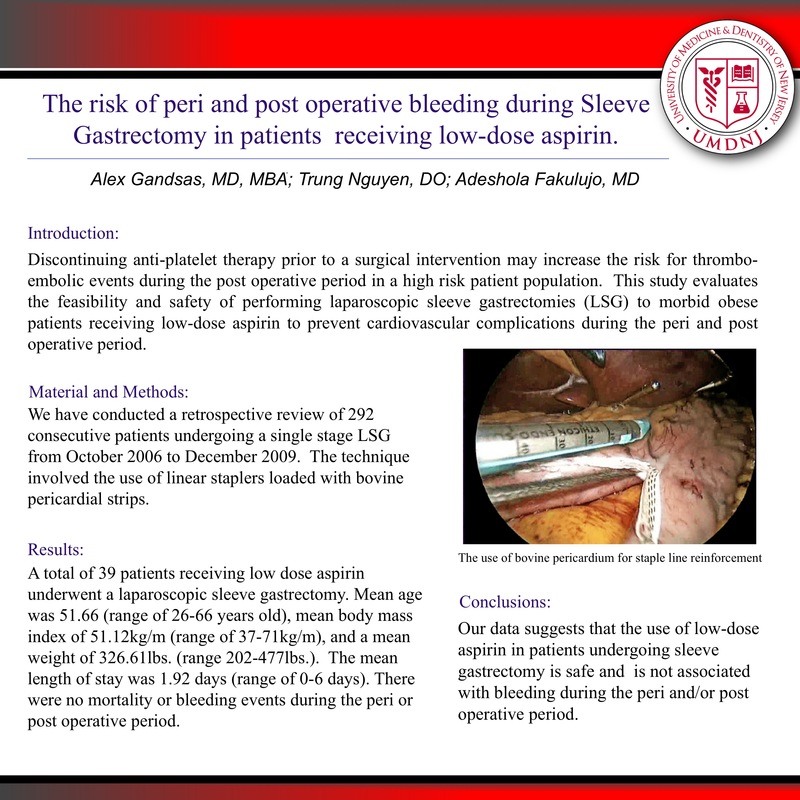 There were no mortality of bleeding events accounted in this study.Conclusion: Our data suggest that the use of low-dose aspirin in patients undergoing sleeve gastrectomy is safe and is not associated with bleeding during the peri and/or post operative period.